Difficulty Notes: There are no technical difficulties to the summit of the Greater Pharaoh Peak. It’s just a long bloody trek!! 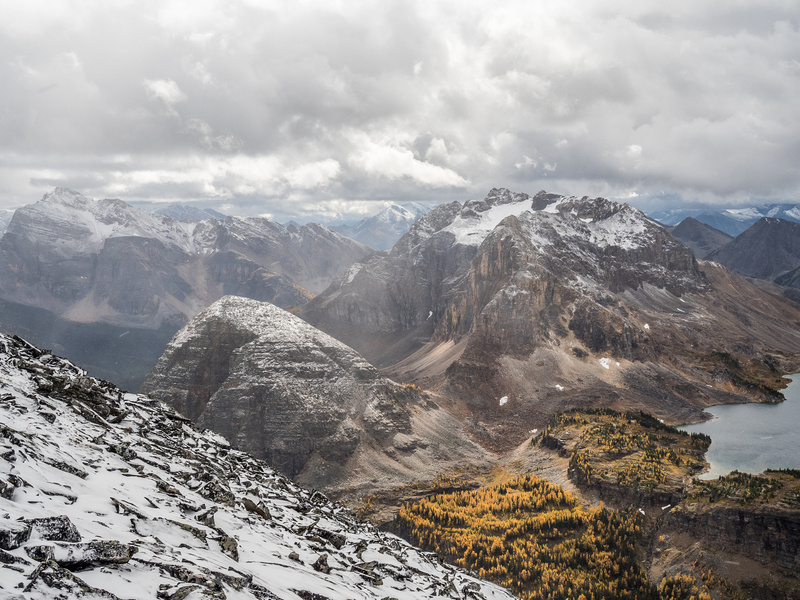 As I watched the giant snow flakes fall gently and silently all around me and settle onto the yellow and red fall foliage before slowly starting to melt, I was struck by a thought that has hit me square between the eyes more than once while solo trekking on various trails and routes through the backcountry of my beloved Canadian Rockies. The beauty that I’d experienced on this long and tiring day – and many long and tiring days before it – was not there for my benefit. It was simply there. 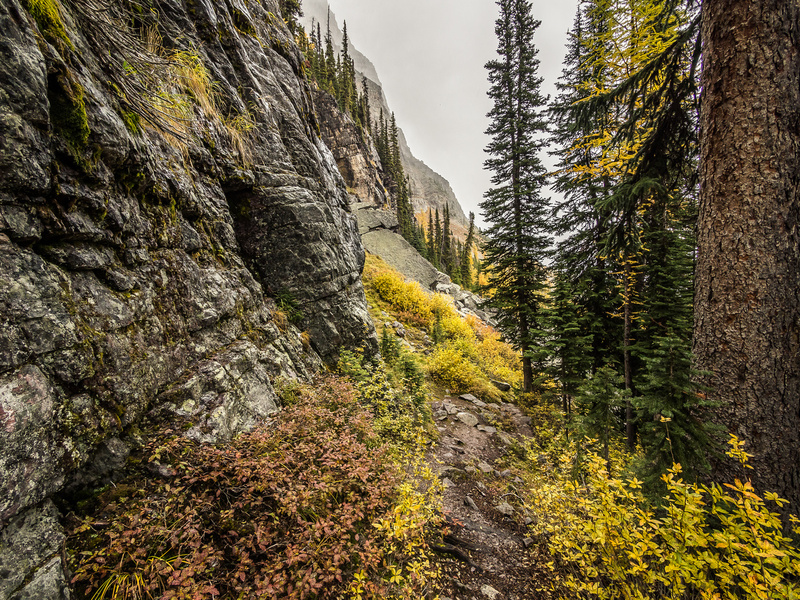 Natural beauty is something that drives many of us out of the concrete jungles where we make a living, out to a more peaceful and reflective existence on the trail – where we are smaller somehow, and more connected with our ancient, wandering roots. While we feel almost a spiritual connection to the land, we often make the mistake of thinking that all the natural beauty that we find beyond our temporary fake and material world, is somehow there for us. Because of us – like it owes us it’s very existence. But this is not true my friends. As I sat there, surrounded by silence, feeling cold little stabs of snow flakes hitting my exposed skin, I realized once again that whether or not I was sitting there, this natural phenomena would still be happening in this little, brightly colored meadow ringed by hundreds of larches and dying mountain grasses and flowers. 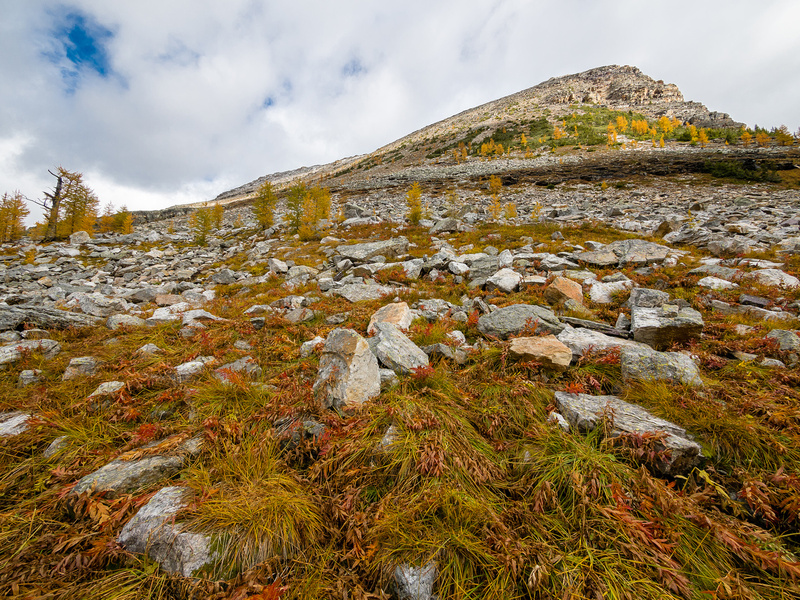 Whether or not my nose could pick up the distinct smell of the dying vegetation, it would still be wafting its warning of pending snow and cold, all across the slopes beneath the towering impassive mountains rising in all directions around me. 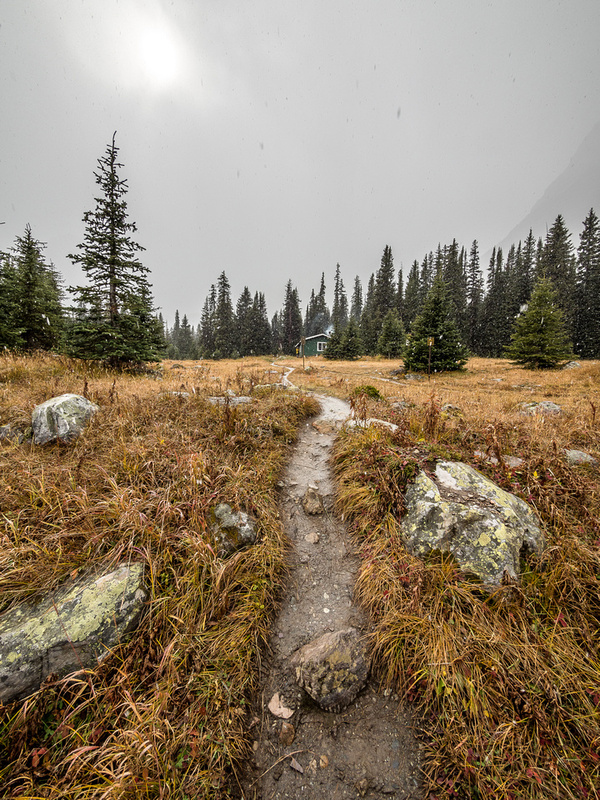 As a matter of fact, within seconds of my departure from this heaven-on-earth, there would only be the subtle smell of me and my footprints in the mud – and the snow flakes would still be silently and gently falling and melting in the meadow. With nobody to see them or feel them or meditate on them. Just me and the Healy Creek Trail. Kilometers and kilometers of it. I don’t know why I was struck so hard by these thoughts on this particular day. 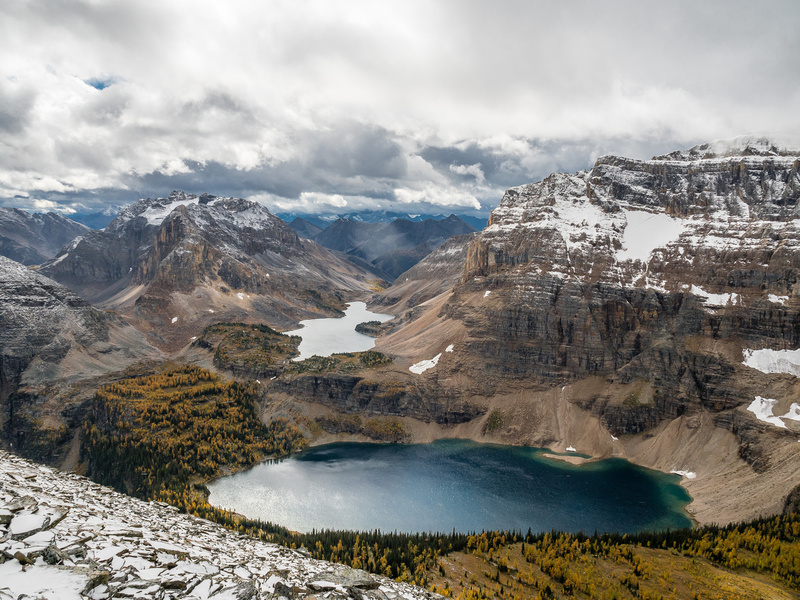 Perhaps it was the sheer visual overload of natural beauty that I witnessed, combined with a tired mind and body after almost 30km and 2 vertical kilometers of height gain. 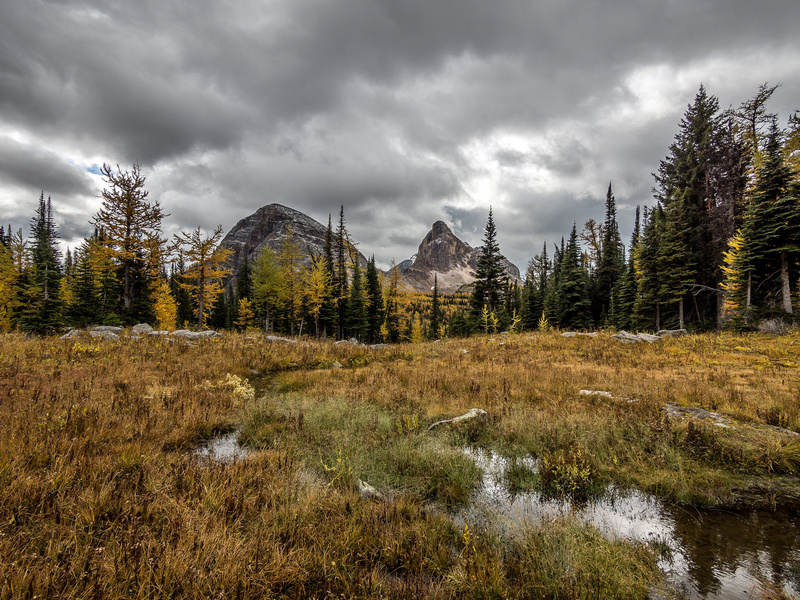 Perhaps it was the combination of unexpected views at almost every turn and the loneliness of 10 hours on the trail by myself, moving quickly through varied terrain from thick pine forests to golden larch stands, from open alpine meadows dotted with lakes and tarns to blinding snow squalls and rain. 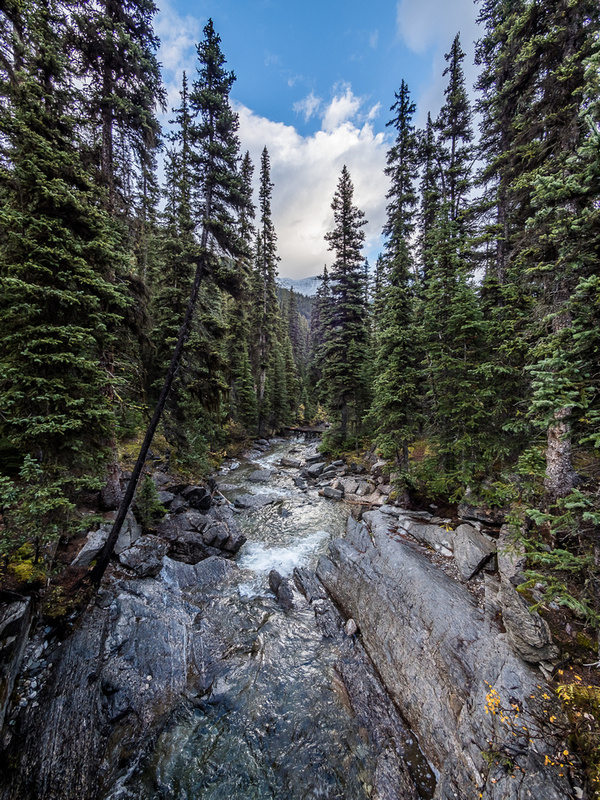 Perhaps it was the smells of all these places that have triggered many countless memories of other situations and meditations in similar locales throughout my 17 years exploring the Rockies. Whatever the reason, I was once again struck by the thought that the natural world owes humans nothing of its beauty, peace or tranquility. We are simply part of it – and a small part at that, despite our current and temporary impacts. Long before the first human-like creature stood up in a forest somewhere and gazed at its reflection, for the first time knowing that it was themselves staring back, and long after us and our egocentric, self-aware minds are gone, snowflakes will continue to fall to earth and melt upon touching sun warmed surfaces below. 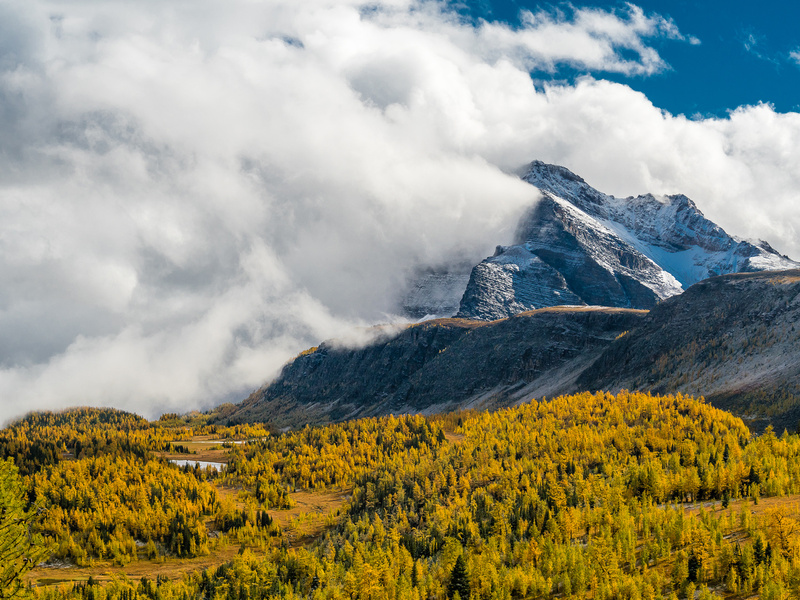 Clouds will drift slowly across blue skies with no conscious minds to appreciate them, and larch trees will continue to turn colors as the seasons change, with no cameras to document it. Sure! There might be a faint trail or bit of pavement here and there to hint at our passing through – but that is no different than a thousand other trails that various animals and creatures of the earth have left over the countless years before the first human had the first reflective thought about a gently falling and melting snowflake. Yes my friends, us humans are not nearly as important as we like to imagine, and I challenge everyone to humble back their attitudes a few notches before this world gets crazier than it already is. Rather than being depressing, the idea that we’re just part of a whole (and not the most important part) can be very freeing and very liberating. A long, wet and lonely hike back down Healy Creek. 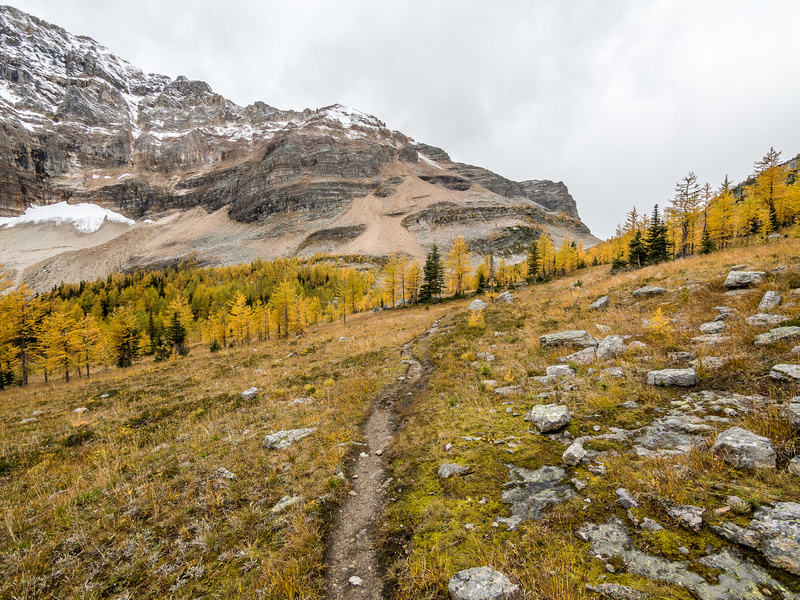 I knew immediately upon reading Matt Hobb’s trip report from a long day bike ‘n hike to the Egypt Lakes area in August of 2015 that I’d be duplicating his efforts some day sooner than later. There were two differences that I was going to do, however. The first was that as much as I love long day trips, Matt’s 42km was a bit much for me. I would go in over the lovely Healy Pass area instead – cutting it down to ‘only’ 30km – and all of it on foot. The second change was the season I wanted to do it in. 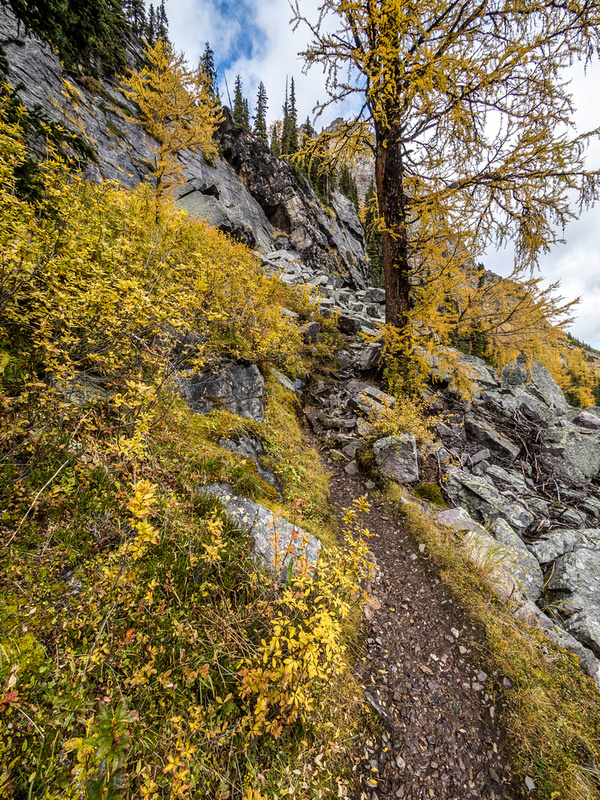 The abundance of larches in Healy Meadows and down from Healy Pass to the Egypt Lakes area made this a no-brainer for late September. Apparently I didn’t have to wait long! 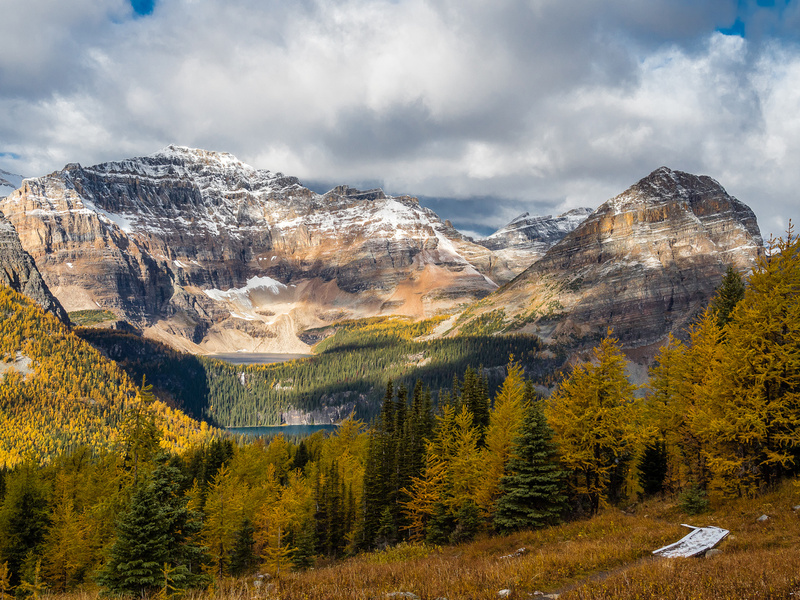 After a long day in Lake O’Hara scrambling Park Mountain with friends, I was ready for an easy, but scenic solo outing on Sunday, September 18 2016. 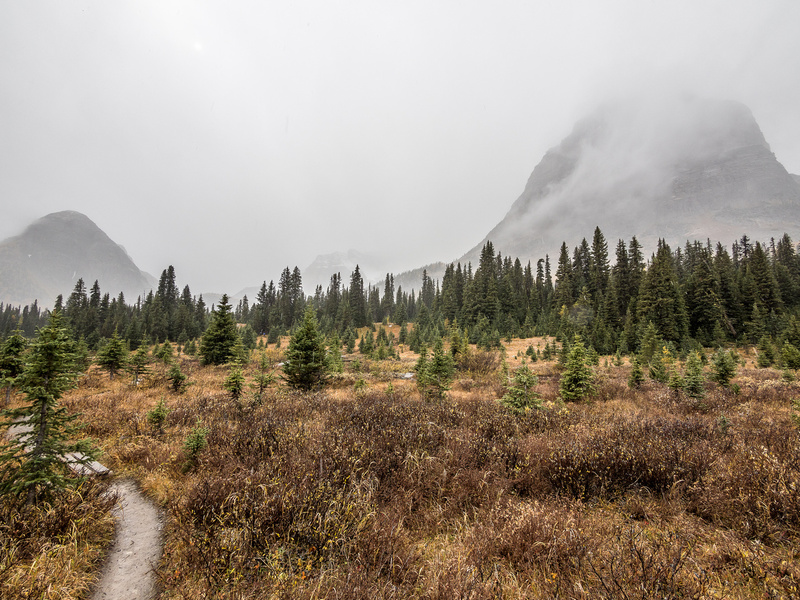 The weather forecast was certainly a mixed bag – there was no guarantee of a summit view – but I figured worst case scenario I’d hike to Healy Meadows and turn around. Not a bad ‘worst case’… The day started cool and cloudy from the Sunshine Ski Resort parking lot. 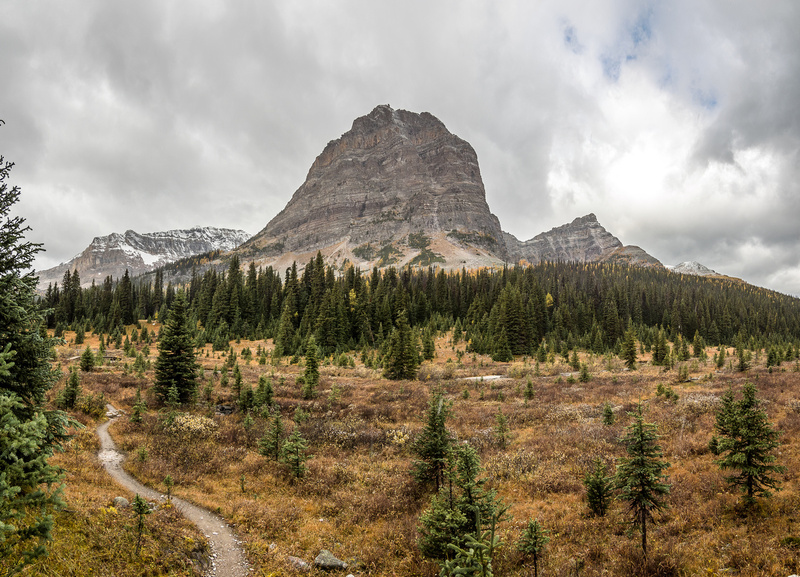 I’d already hiked the long trail through forest to the Simpson Pass turnoff when I scrambled The Monarch earlier this year. It hadn’t changed much. 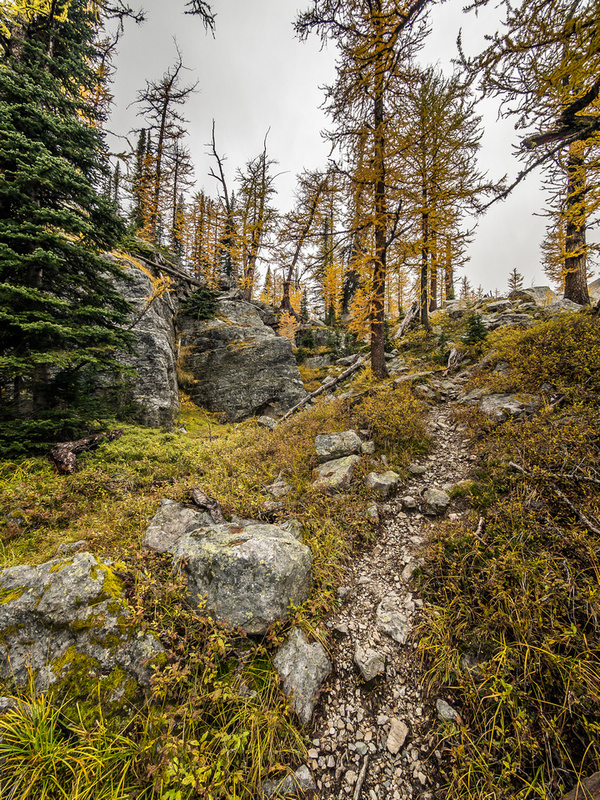 Still a pretty long trudge – but it got the cobwebs out of my brain and the sharp smell of fall filled my nostrils with promise of turning larches as I sped up towards the meadows. 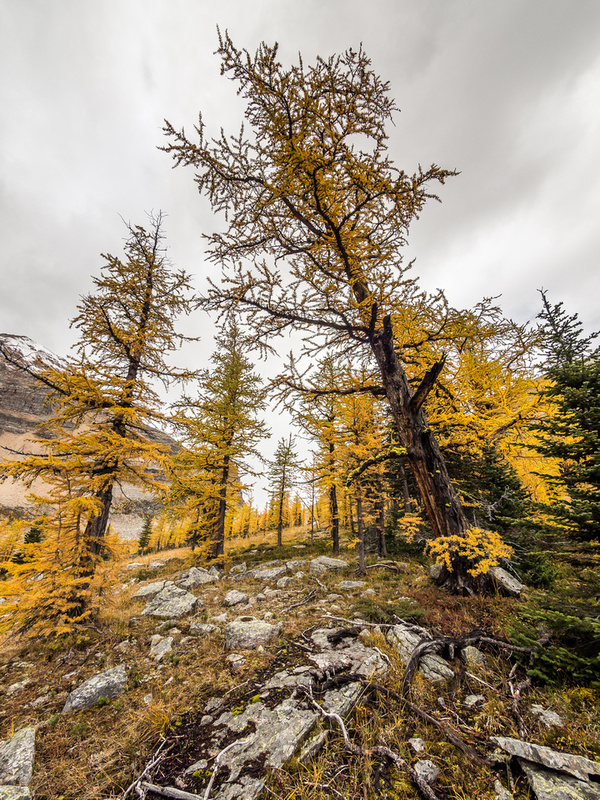 Some larches are more aesthetic than others. 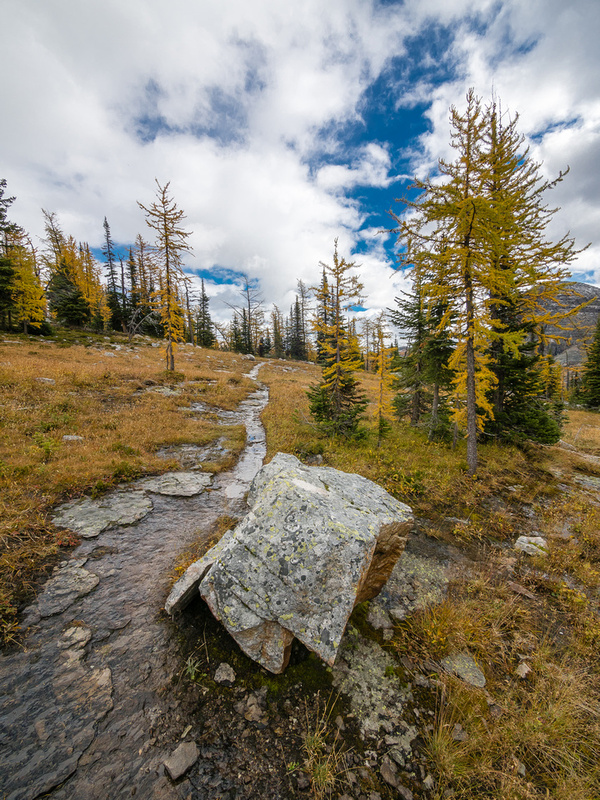 It didn’t take too long and I was experiencing Healy Meadows during larch season for the first time. (I’ve been to the meadows tons of times in winter.) I was all by myself as I wandered the excellent trail up towards the pass, my jaw dropping every time I turned to my left and looked out at the improving views of the Monarch Ramparts stretching towards the hulk of the Monarch itself, staring back at me over the thousands of brightly colored larches dotting the meadows between us. 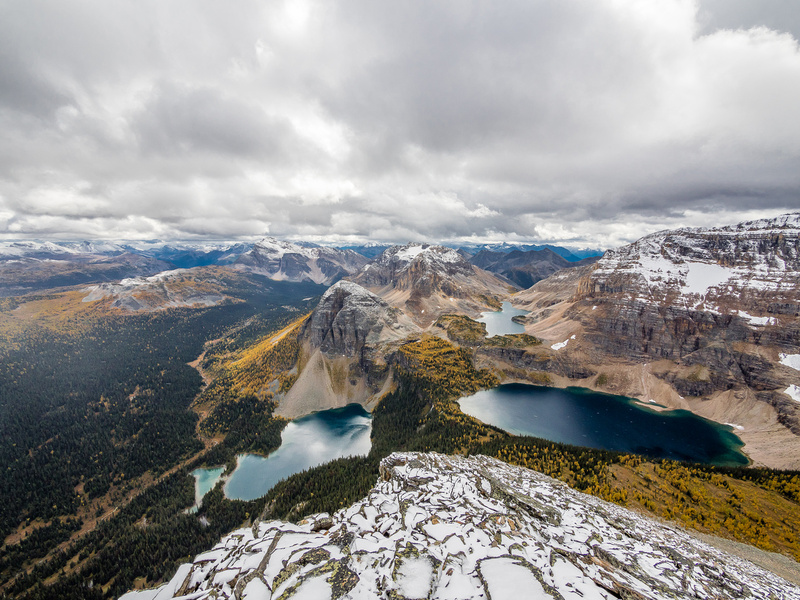 The few sparkling lakes and tarns scattered beneath me added to the magic. With the weather holding as I crested Healy Pass, I decided to go for it. The Pharaoh Peaks looked too darn inviting to turn down on this particular fall day. As I descended from Healy Pass (losing at least 400 meters to the valley below), I ran into the first of many backpackers coming out of the Egypt Lake area. Judging by the comments and the soaked gear, they’d had a rather rough and wet day the day before. I continued downwards while they struggled up the pass with their heavy loads. 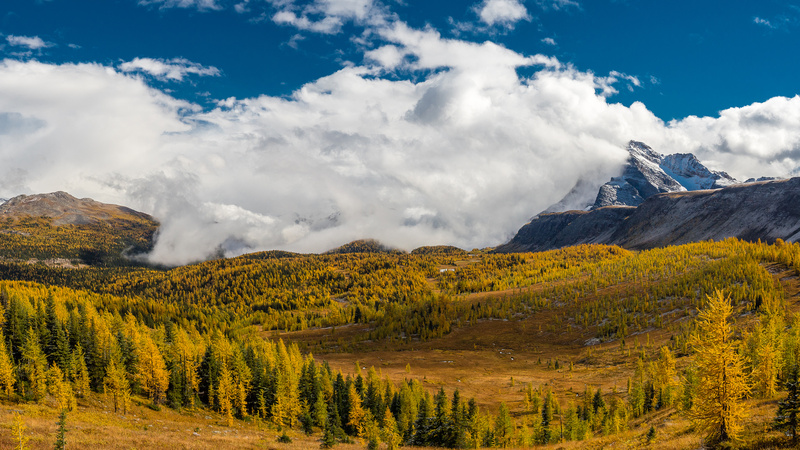 The larches on the west side of Healy Pass were absolutely spectacular! 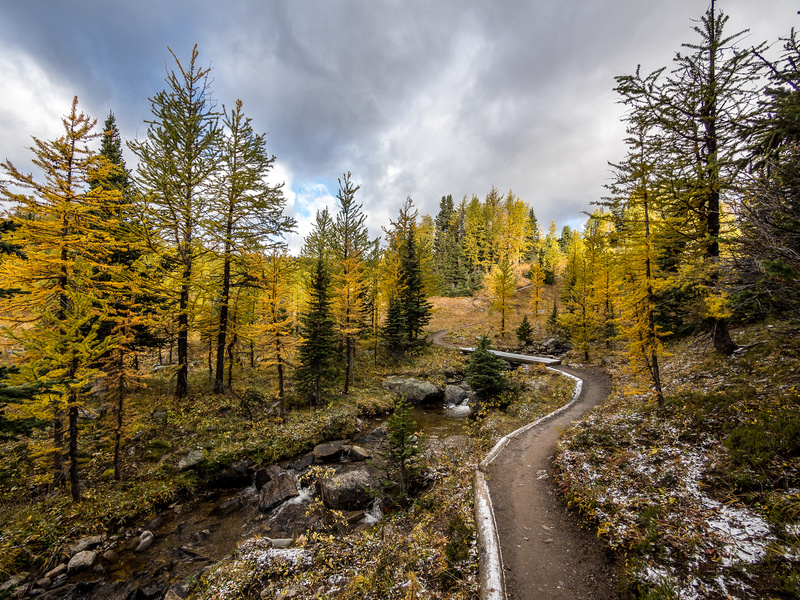 The rain and moisture only brought out their colors even more vibrantly and it was with reluctance that I bid them adieu and continued back into the pine forests of the upper Pharaoh Creek valley. 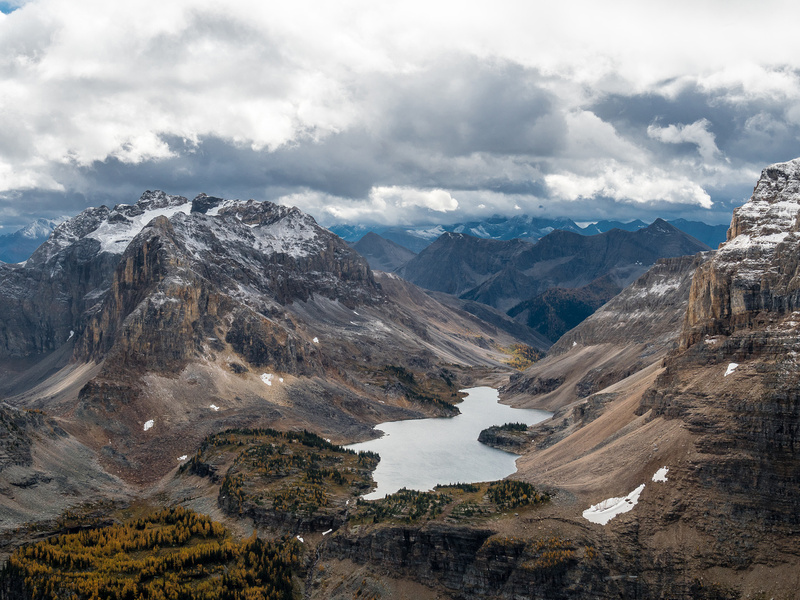 I couldn’t believe the number of folks heading back out over Healy Pass with heavy loads from Egypt Lake – apparently it’s a pretty popular camping destination, as it should be considering the beauty of the area. The Monarch does NOT look friendly today! Note the brilliantly lit larch forest coming off Sugarloaf in the foreground. After reaching valley bottom and noticing the warden cabin hidden off to my right, I took a sharp left turn over Pharaoh Creek and was soon striding past the basic Egypt Lake Shelter and the nearby campground where people were still taking down their tents and shaking off what must have been a grim Saturday the day before. 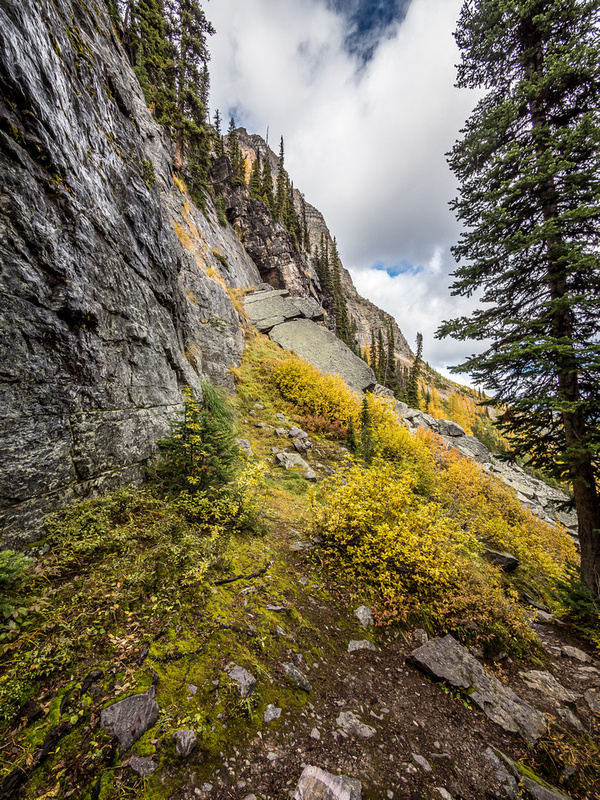 I briefly followed two other hikers from the campground heading towards Egypt Lake but they continued on to the lake and I began working my way up towards Whistling Pass and the lower south slopes of Greater Pharaoh Peak. Unlike Matt, who’d taken lots of time to explore the various lakes in the area on his trip, I knew that I was playing the weather lotto and didn’t want to lose after going this far already. 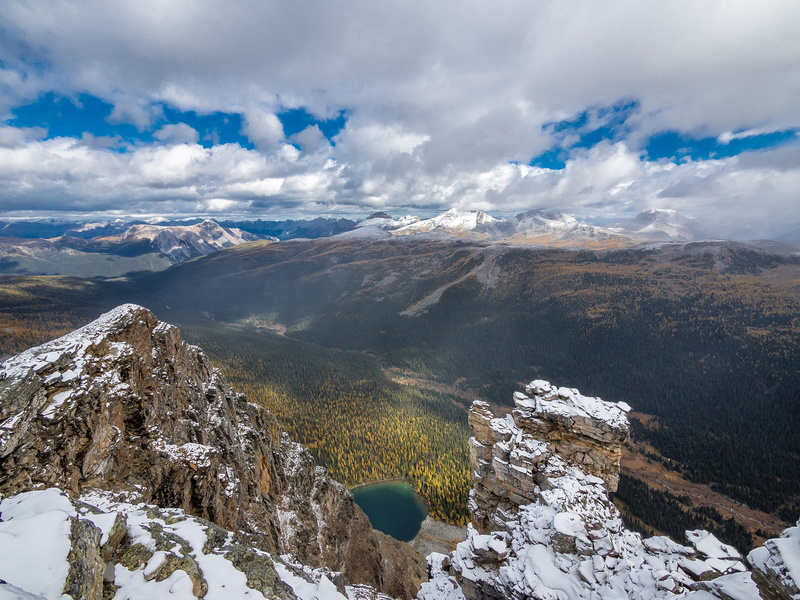 The skies were mostly grey with some patches of brilliant blue and the occasional intense snow flurry moving through. 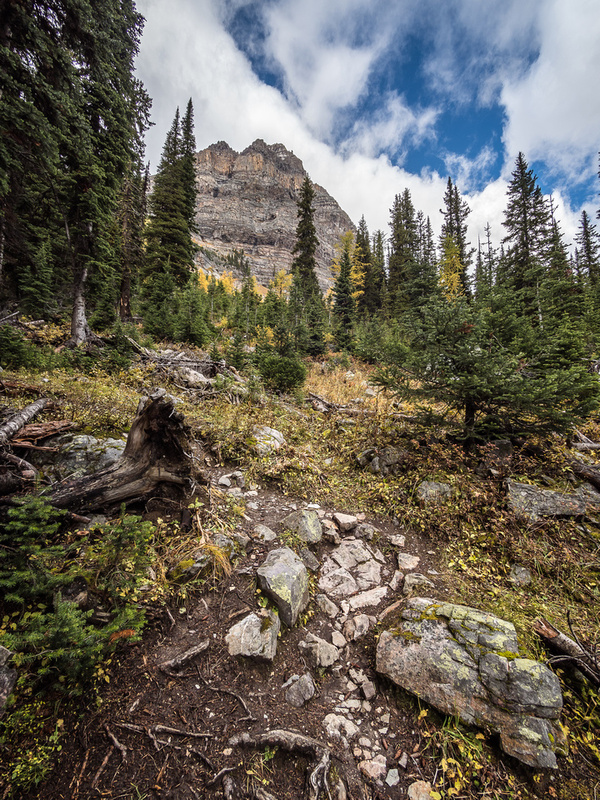 The steep and rough trail up the headwall beneath Pharaoh Peaks and leading to Whistling Pass was full of great views and mud. Yes – mud. As a matter of fact I’d been in far more mud already this day than I was expecting. Not a huge deal, but keeping my feet reasonably dry in my light approach shoes was becoming a bit of a chore. 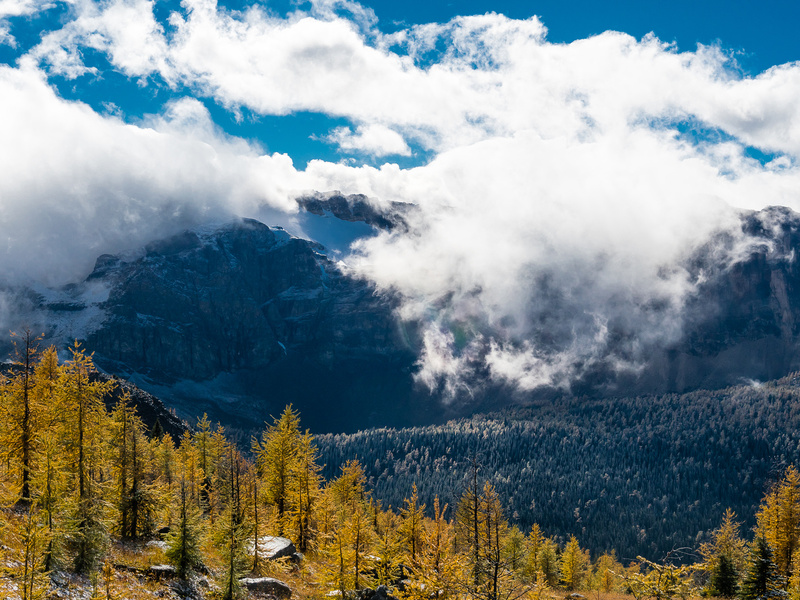 Eventually I reached high enough to start seeing larches again and the wild skies combined with increasingly stunning views kept me entertained enough to forget how far from my car I was. 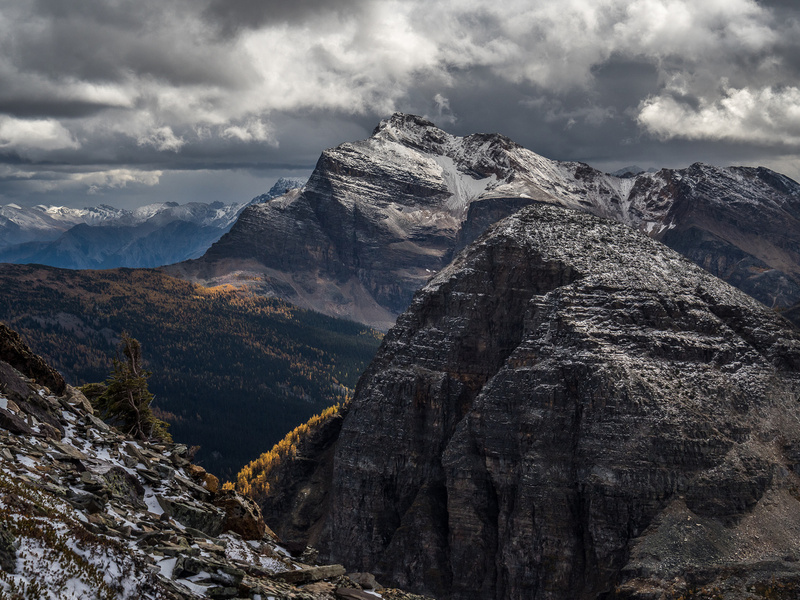 I heard someone coming down the trail and soon ran into another solo hiker who decided the snow squalls were too intense to bother with the summit of Greater Pharaoh. He had to backpack to Twin Lakes yet that day. I decided that I’d come this far, so I’d continue to play the weather lotto and hope for the best. We parted ways and I was once again alone on the trail. 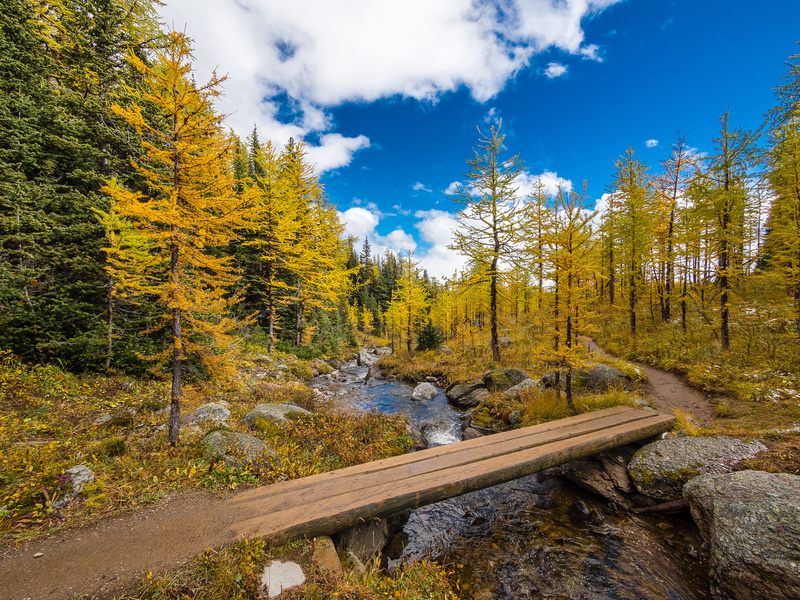 Taking the interesting boardwalk towards Whistling Pass and Scarab Lake. I used to get very nervous solo trekking in the Rockies but now I love it. There is no better way, IMHO, to truly experience the peace and silence of nature than to put yourself in the middle of it – alone. Just don’t watch The Revenant the night before going. 🙂 Soon I was winding my way into the Scarab Lake Valley and across the south slopes of Pharaoh Peaks. 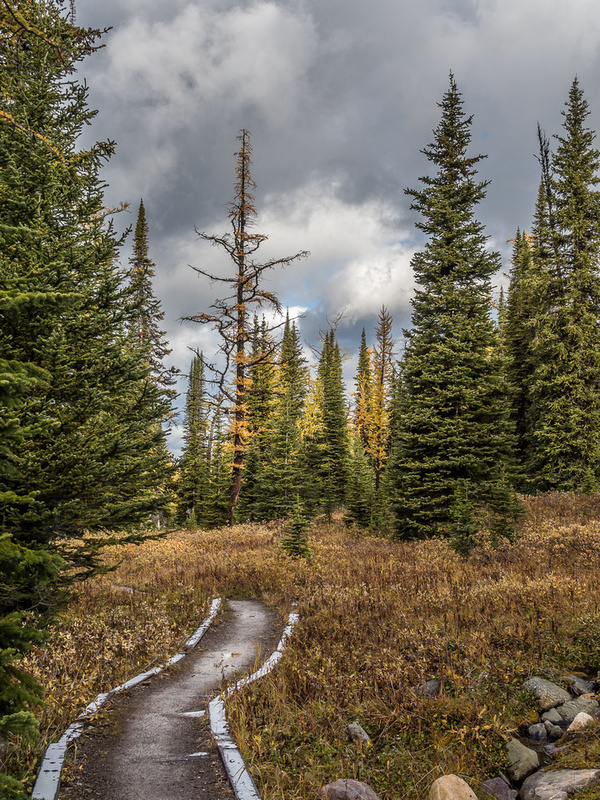 Since I was already near treeline at this point, I simply waited until the rubbly slope above looked reasonable and headed up, into thick grey clouds and increasingly intense snow flurries. It didn’t take long and there was fresh snow sticking to the rocks under my feet. Being in runners didn’t increase my confidence that I was going to summit, but I stubbornly kept going despite the weather. The long day on Friday (Park Mountain) was wearing on me as I struggled up the final slippery boulder slope to the highest point on Pharaoh Peaks. But than a miracle happened. 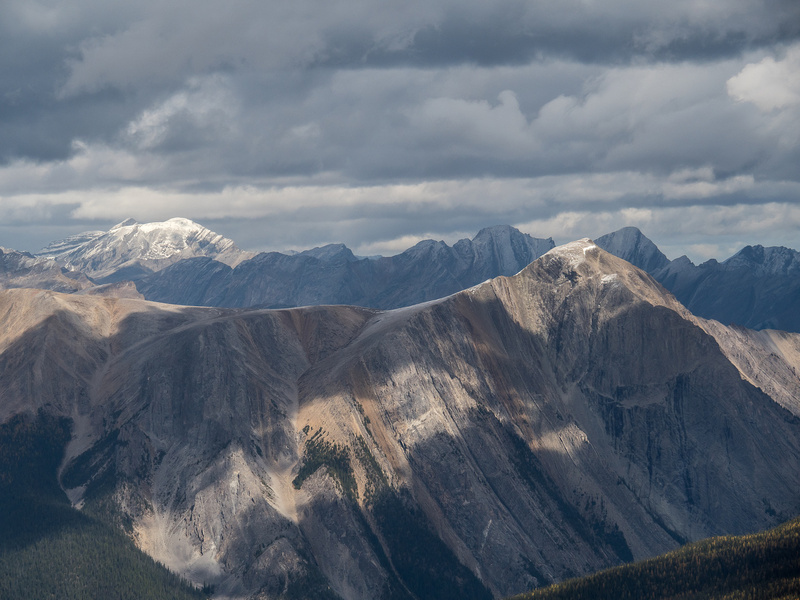 Ok – I don’t believe in miracles, but a coincidence occurred that happened to be in my favor – the skies started clearing as I topped out to a summit panorama that almost overheated my poor camera. The snow squall is literally just blowing away at left as I summit. 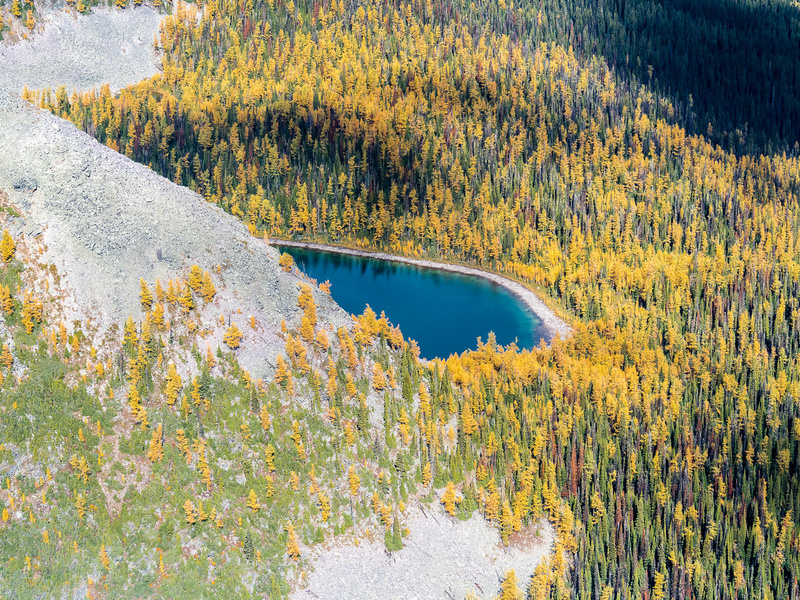 Egypt, Mummy and Scarab Lakes along with a million larches contribute to my camera overheating. The views in every direction were jaw-dropping. Of course Scarab, Egypt and Mummy Lakes stole the show, but the Monarch, Scarab Peak, Haiduk Peak, Mount Ball and the Massive Range (Pilot, Brett, Bourgeau) were just as impressive. 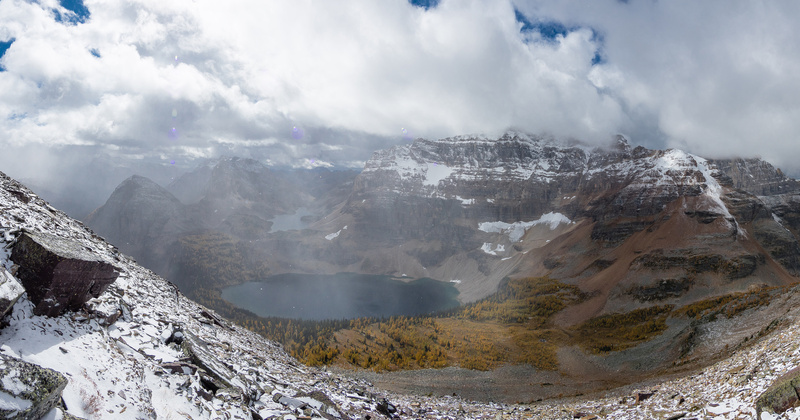 I wandered around the summit block a bit, trying to get various other lakes and angles in my lens. 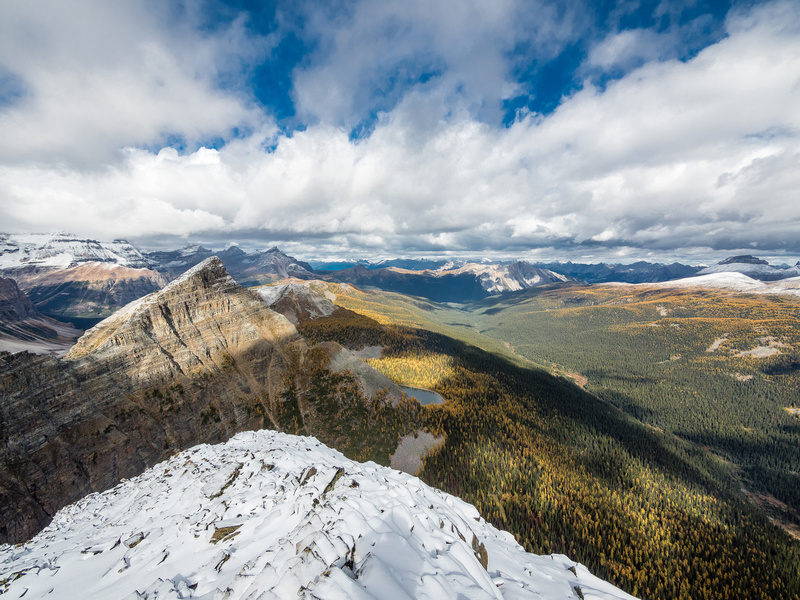 This is one summit you should walk around a bit for better angles – even a few meters can make a huge difference. For example, you can’t even see Egypt Lake from the summit but if you go down just a bit the whole thing comes into view. It’s the same for Black Rock Lake, which isn’t visible from the very top. The clouds stayed parted long enough to capture way too many photos and soon I was heading back down – I had a long way to go yet this day! 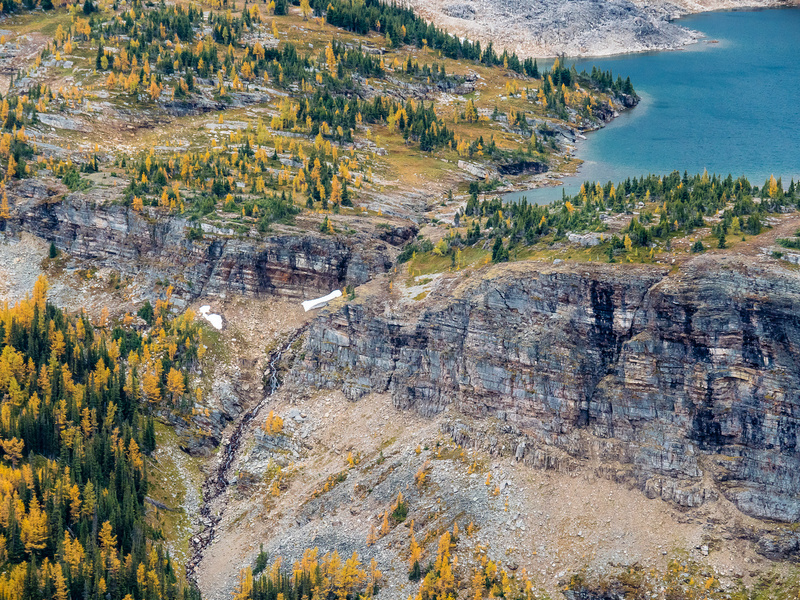 The long Pharaoh Creek and Redearth Creek valley is another approach for the Egypt Lakes area. 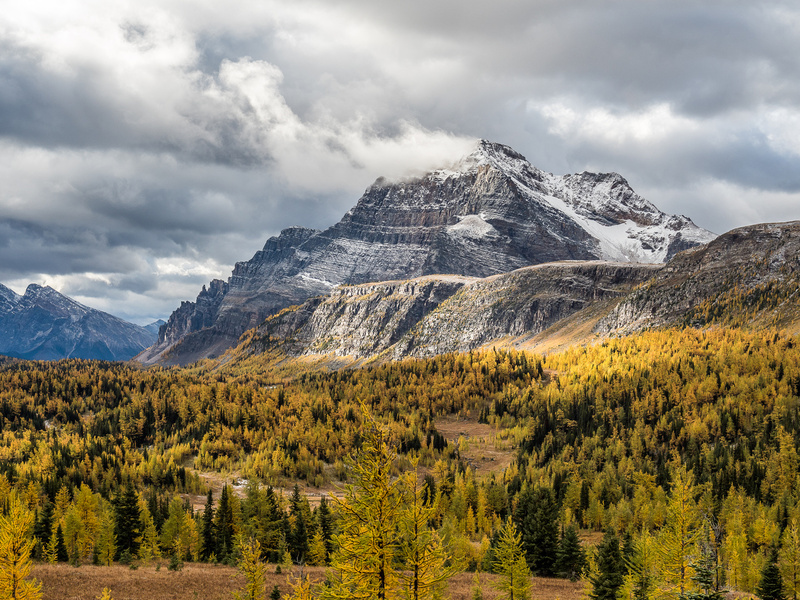 Incredible larch scenery with the Massive Range including Pilot, Brett, Black Brett and Bourgeau in the background. A wide angle view over the Egypt Lakes. 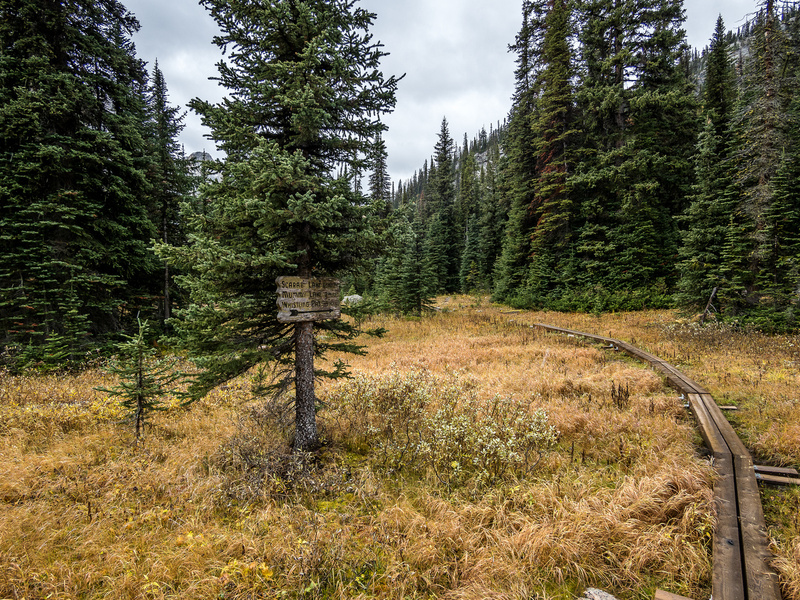 As I worked my way down the muddy trail towards Pharaoh Creek again, the weather turned ugly for a few hours. 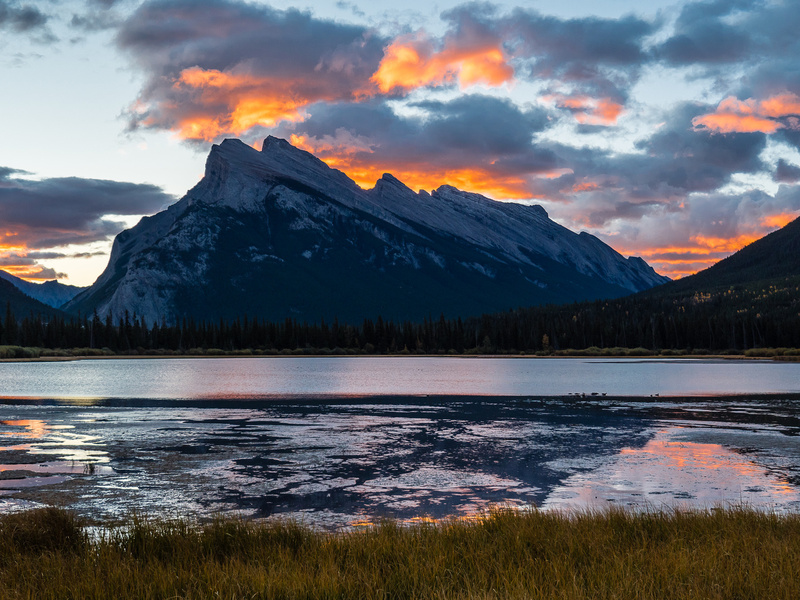 It was so bad I had to put my camera in the pack – and that doesn’t happen often or easily! I stumbled my way back past the shelter and across the creek before starting my way back up to Healy Pass for the second time that day. 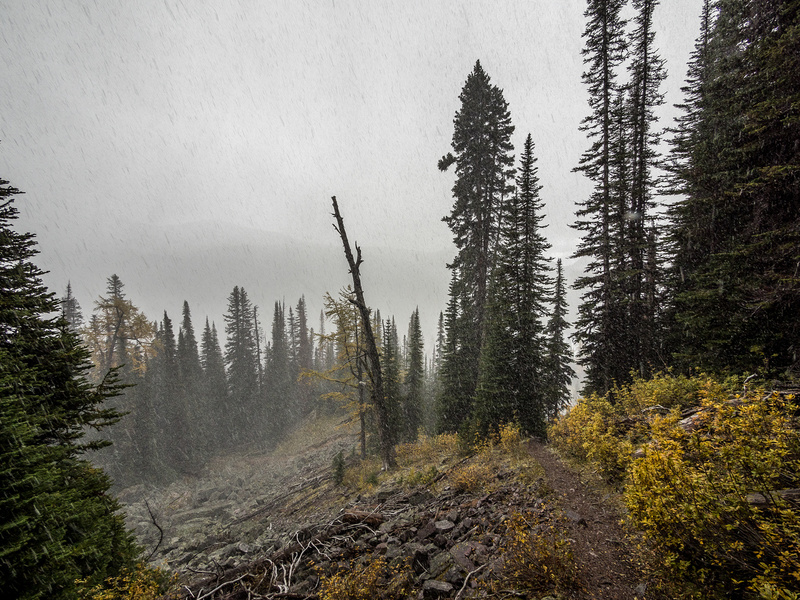 The snow was coming down fast and furious as I worked my way up the abandoned trail. I felt very alone in a world of white and green – but it felt wonderful. My mind was full of the beautiful views and many hours of trail pounding as I took a break and meditated on life (i.e. the opening few paragraphs of this report). And wouldn’t you know it? 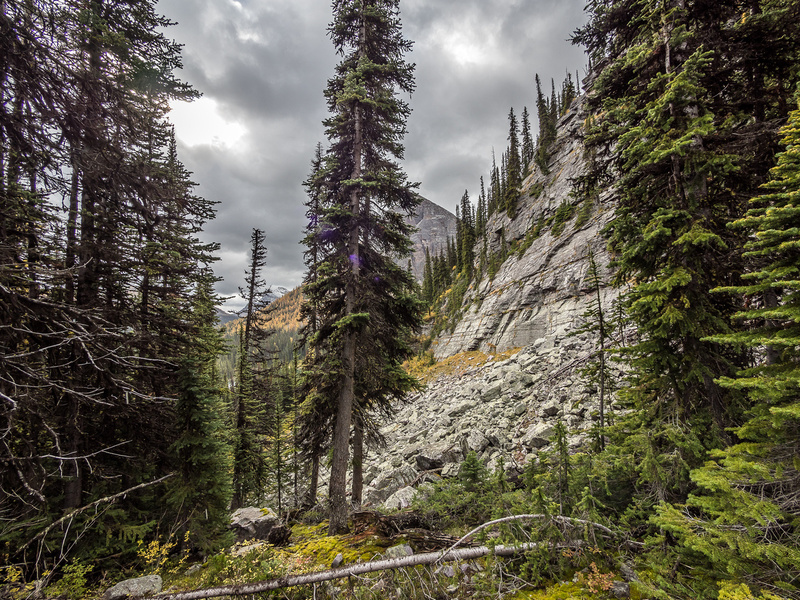 Just as I re-entered the larch forests under Healy Pass, the clouds parted and the weather once again cleared up! Talk about timing! WOW! 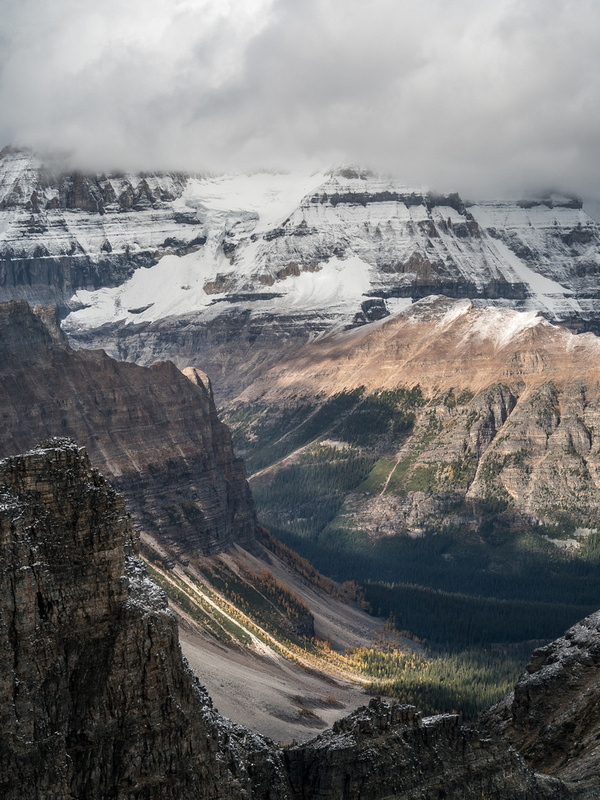 The views from Healy Pass were even better than those from the morning. The Monarch was shedding a massive cloud and the scene was wild and primitive. The fact that I was enjoying the entire area to myself on this spectacular late afternoon made it even more special. I finished the last of my coffee before tearing myself away from the scene and starting the long trek back down Healy Creek to the parking lot. 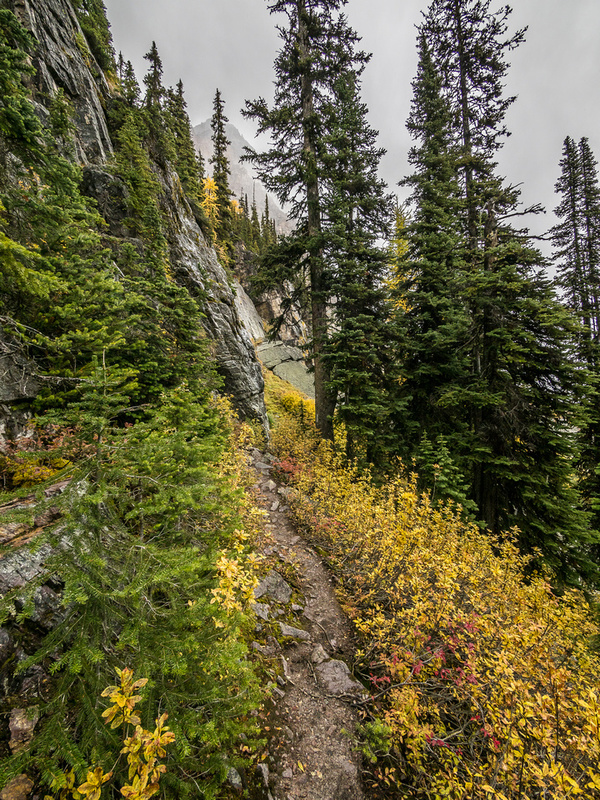 Descending from Whistling Pass on a very wet trail. This was the view over Healy Meadows towards The Monarch from Healy Pass. This was obviously a stunning fall trip and has already resulted in changing my top 10’s list. 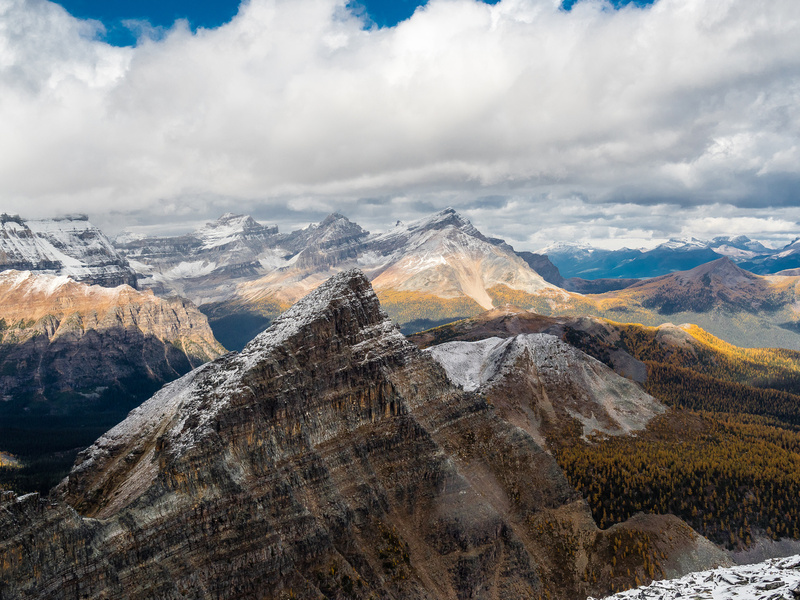 I can’t imagine why this easy peak hasn’t made the guidebooks yet but that shouldn’t bother you – rather it should be considered a huge bonus. 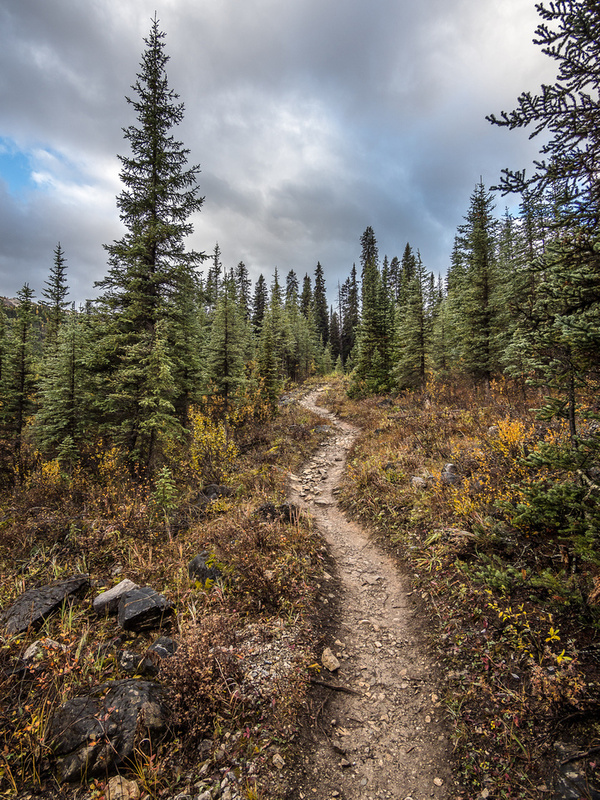 It’s probably somewhat easier to bag it if you’re camped in the area, but a day trip isn’t out of the question as most of it is on good trails. I did the 30km in 10 hours so even a more relaxed pace would easily be done in less than 12 or 13. Just make sure your camera has plenty of batteries and storage. You’ll need it. 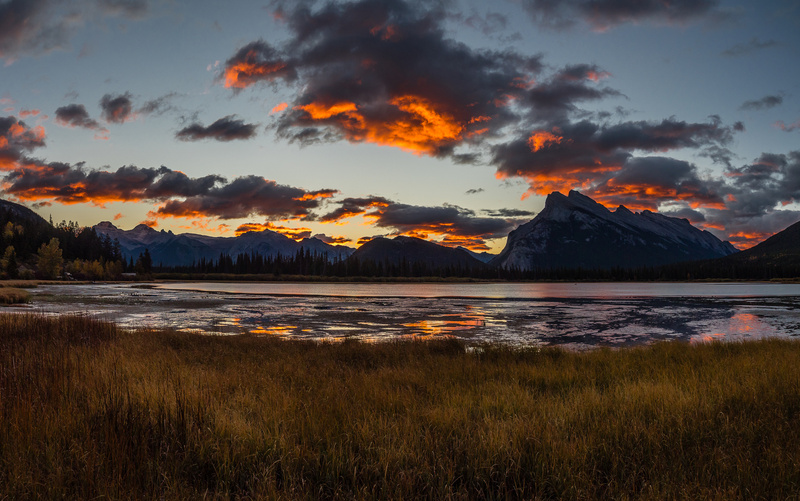 My day started pretty good with a beautiful sunrise over Mount Rundle. NOW we're talking. 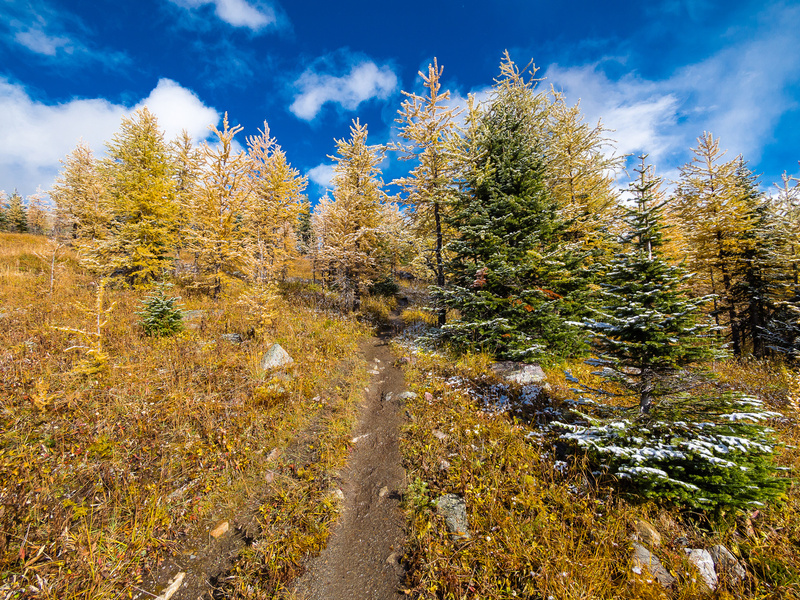 Healy Meadows is literally crawling with larches. 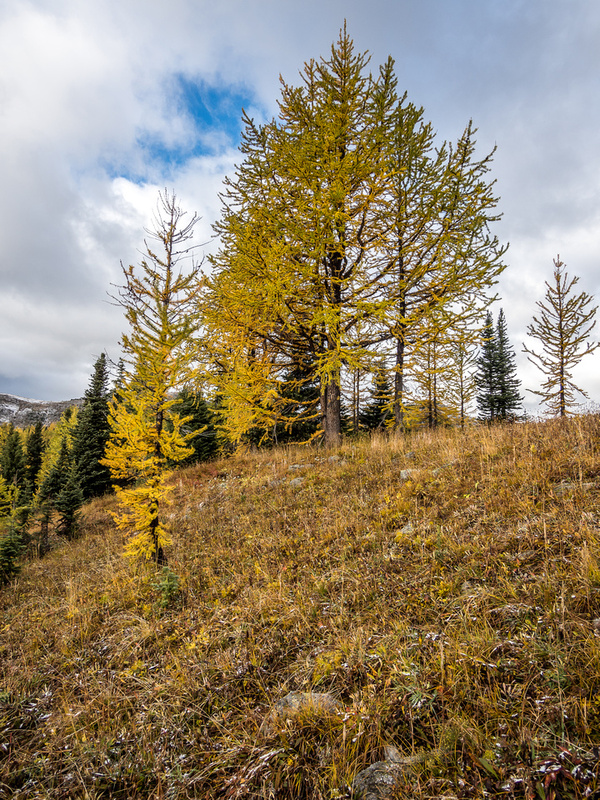 So many larches. 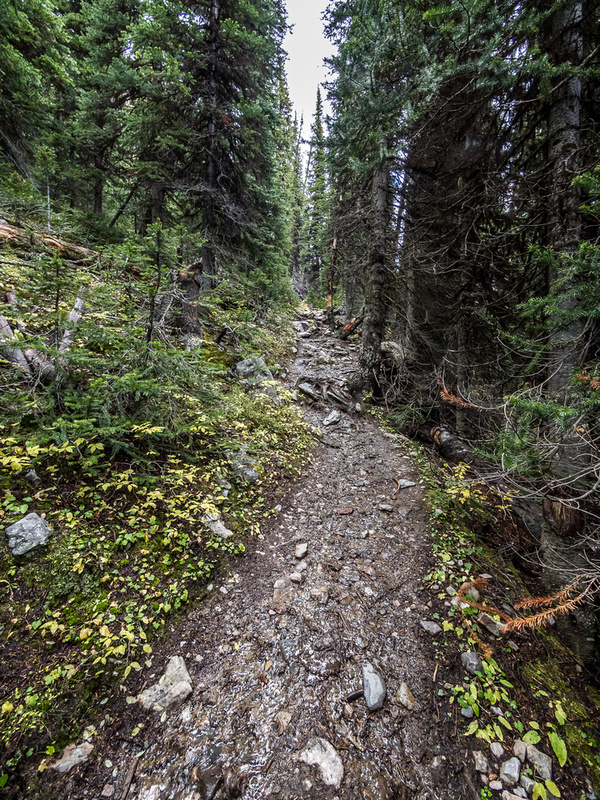 The well maintained trail to Healy Pass. Yikes. My camera starts to overheat at the scene of a larch forest and The Monarch. Despite some intense snow flurries, the weather isn't looking too bad as I close in on Healy Pass and glance back over the meadows and along the Monarch Ramparts on the right. Heading down to Pharaoh Creek from Healy Pass - Pharaoh Peaks just right of center. Pharaoh Peak rises at right. My destination rises at right with Egypt and Scarab Lakes at center and Scarab Peak rising above them. Sugarloaf Mountain in the foreground at left. 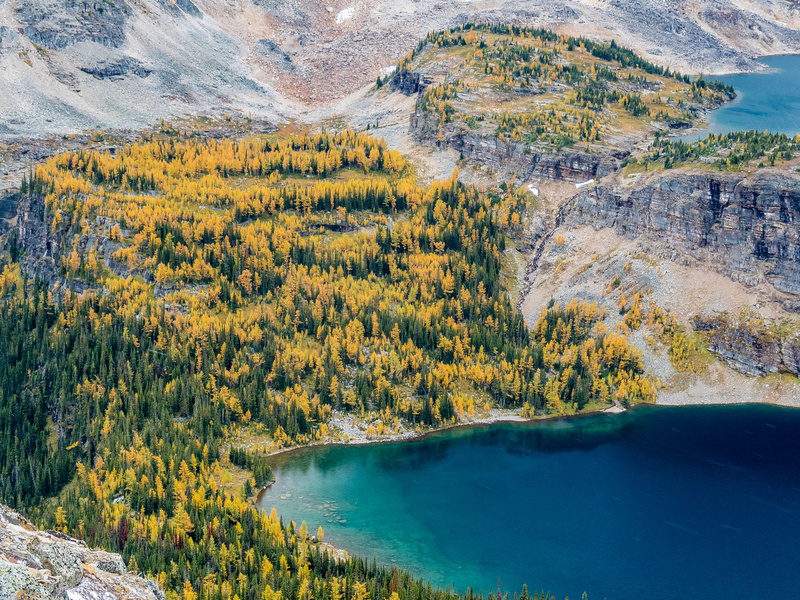 Some larches are more esthetic than others. 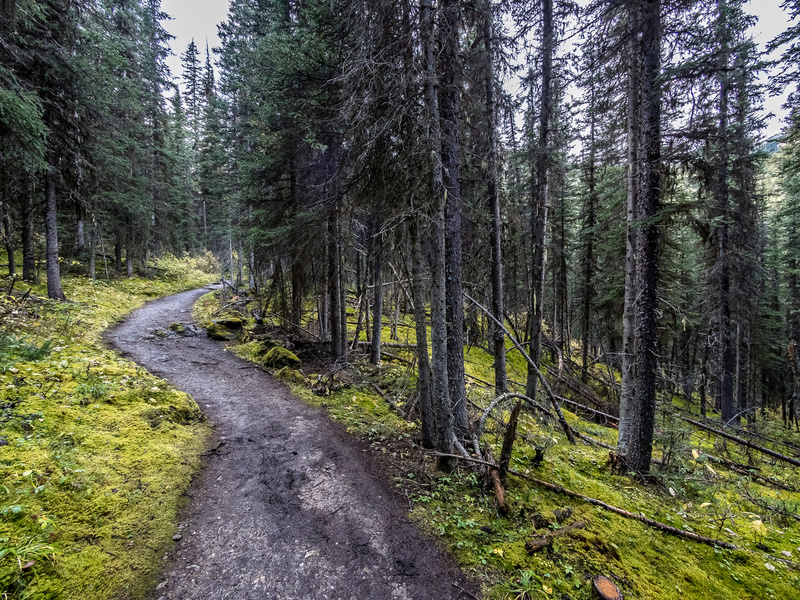 The trail beckons me on. The east face of Greater Pharaoh stares back at me as I turn towards it - finally reaching the Pharaoh Creek valley floor. 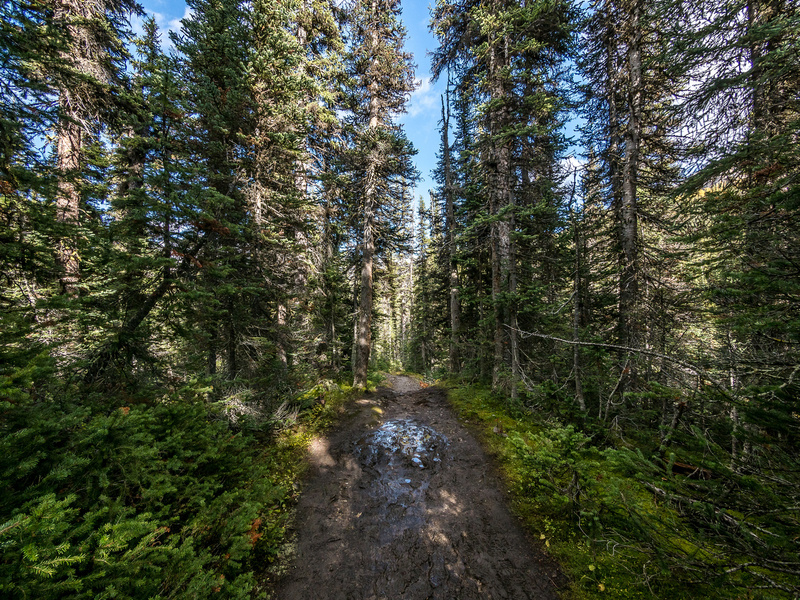 The trail up to Scarab Lake is steep and a bit more rustic than the highways I've been on so far this day but it's still really good traveling. Greater Pharaoh rises above me here. The views are stunning from everywhere today. 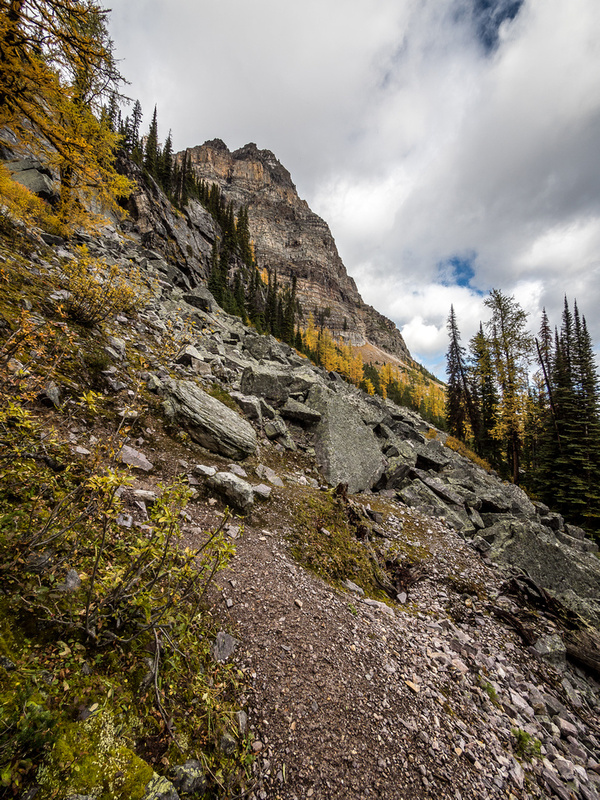 I love it when trails seem to navigate impenetrable headwalls such as this one. 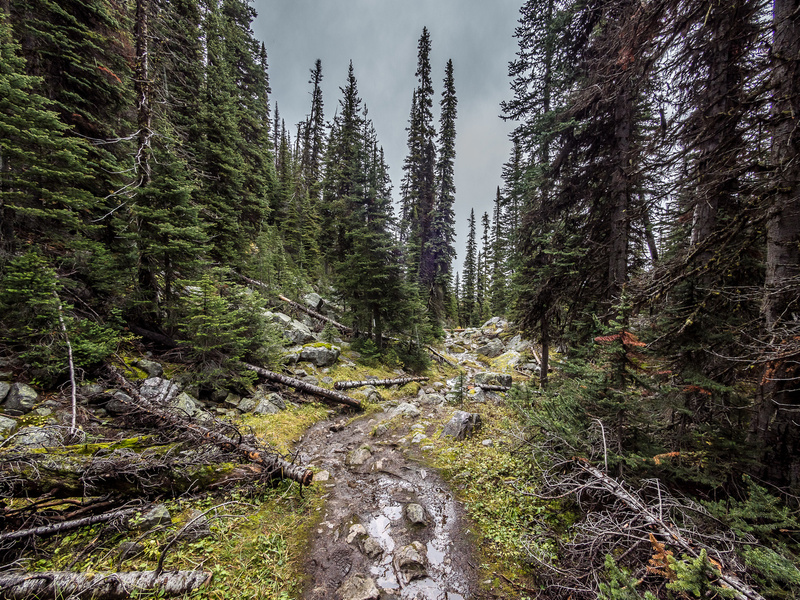 The trail starts to get wet as I ascend higher. Finally reaching the upper Scarab Lake valley - it's pretty wet up here! Starting to head up Pharaoh - the route is very obvious and easy. I could tell part way up Pharaoh that my views from the top would be stunning - IF the weather cooperated. This was not a guarantee! 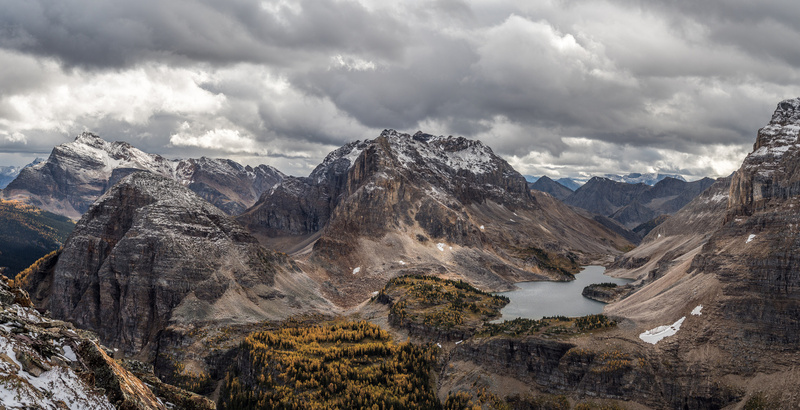 Mummy Lake and threatening skies. 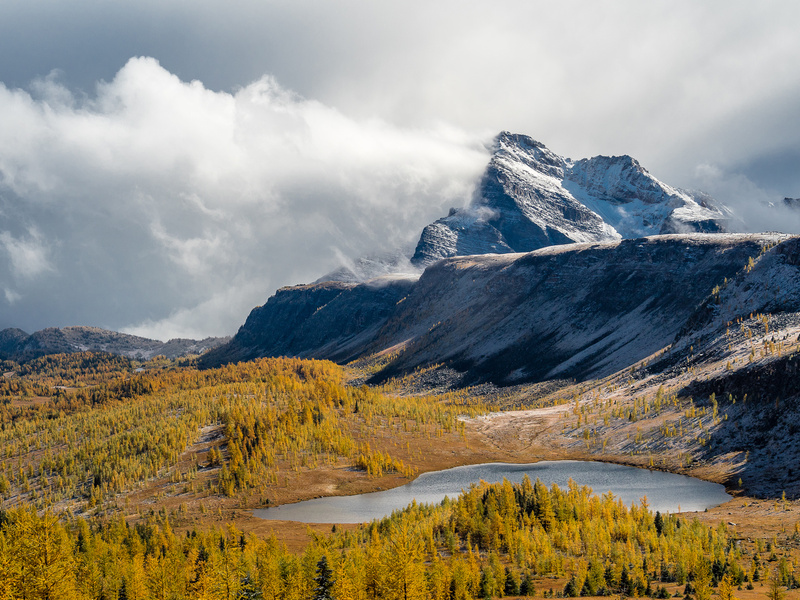 Looking over Sugarloaf Mountain and the larch forest near Mummy Lake towards The Monarch (L). 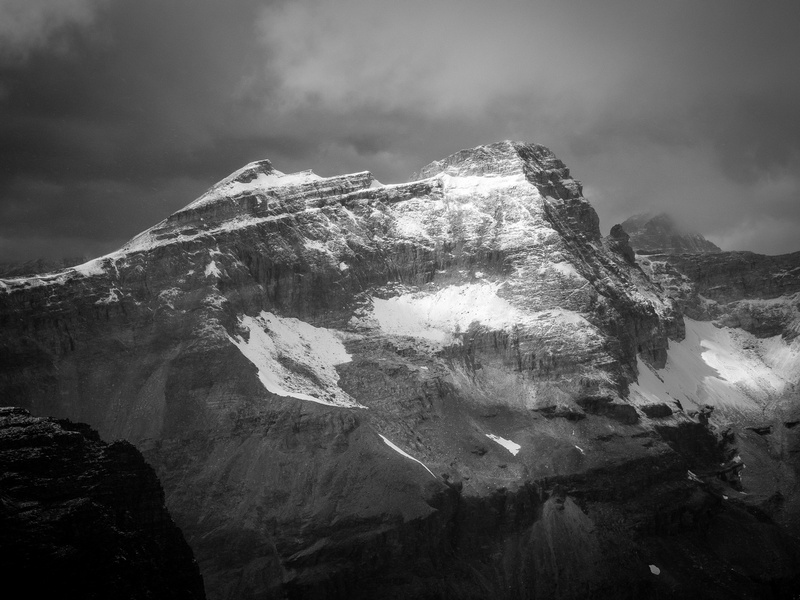 Dramatic lighting on an outlier of Haiduk Peak. 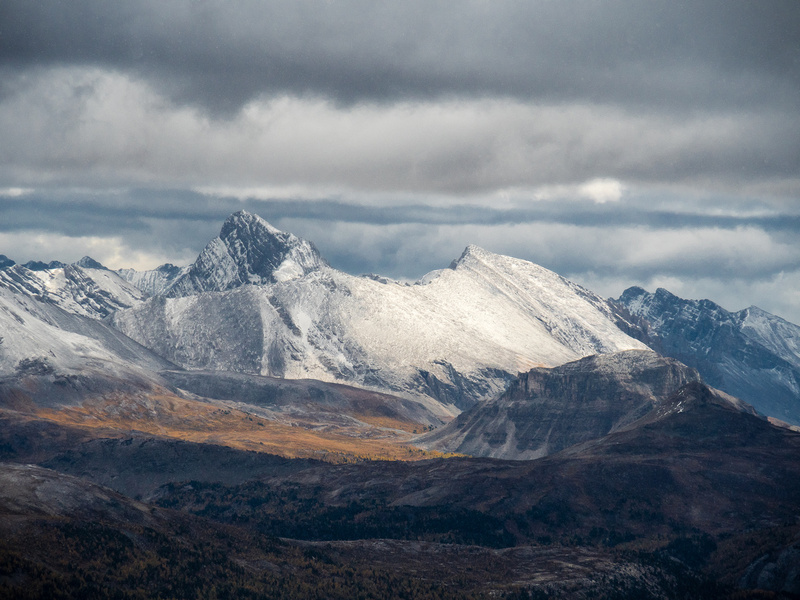 A bit wider view to the east with the clearing snow flurries and my long approach over Healy Pass at center. Pharaoh Lake is just visible to the north. Lesser Pharaoh Peak to the north with Mount Ball in clouds at left and Storm Mountain at center distance. Copper Mountain in the foreground catches some sun, as does Bonnet Peak at far left. Noetic and Flints Peak are not ascended often. Mount Ball looms above the Haiduk Creek Valley. 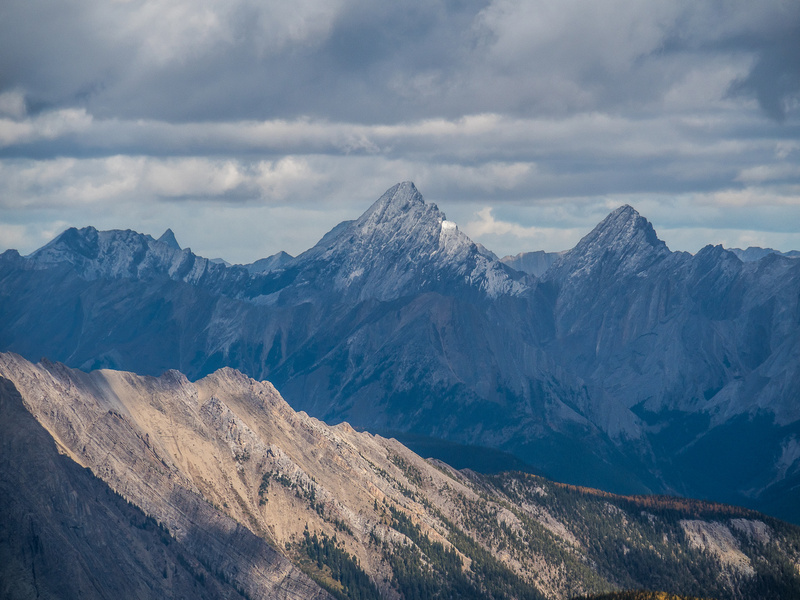 Peaks around Citadel Pass include Golden, Fatigue and Citadel (L to R). 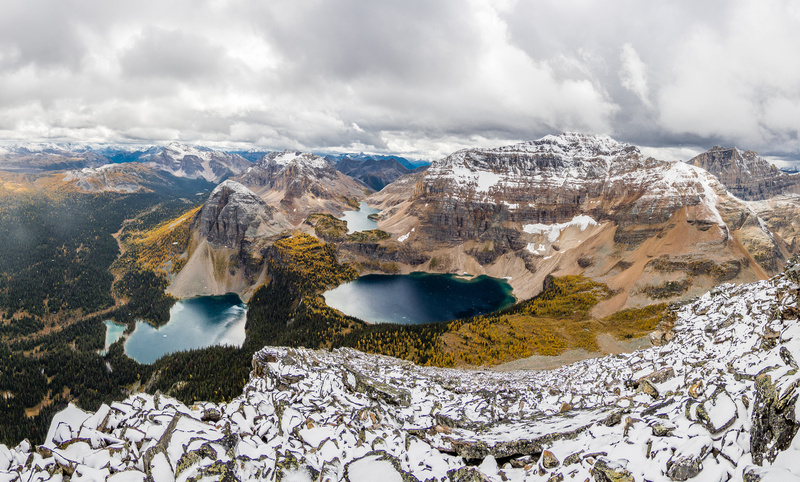 Black Rock Lake is only visible if you traverse east on the summit block - it's worth it! The Monarch, Sugarloaf,Unnamed and Mummy Lake as I descend from the summit. 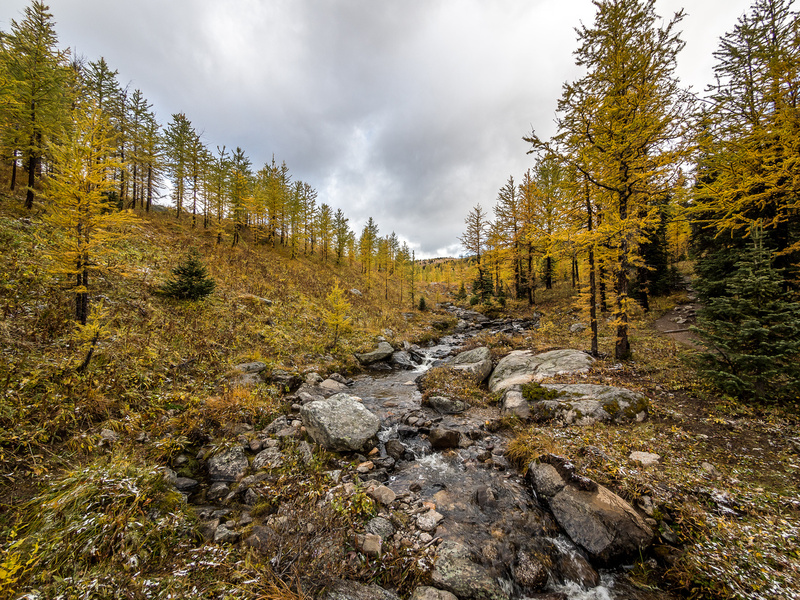 Waterfall and larches around the Mummy Lake drainage. Scarab Lake with the Mummy Lake stream above. Looking back at Whistling Pass as I start my long exit. 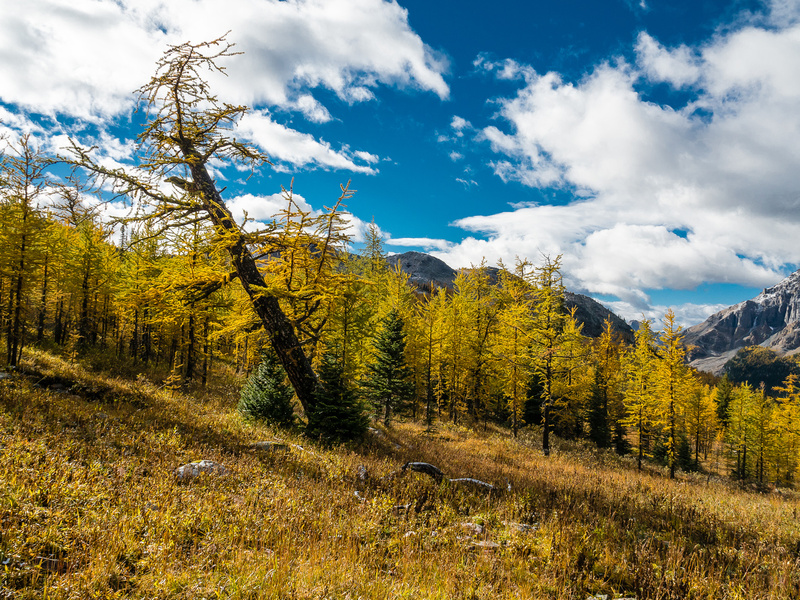 The brilliance of the larch forests cannot be overstated. The rain and snow saturated the landscape bringing out the colors. Everything is soaked and it's about to get more. Looking back up the Whistling Pass trail as I descend. Well maintained but a bit more rustic - and the sky is getting grey. Just before putting the camera away for a couple of hours as the snow intensifies. Looking back at Pharaoh just before heading into the forest and up to Healy Pass again. 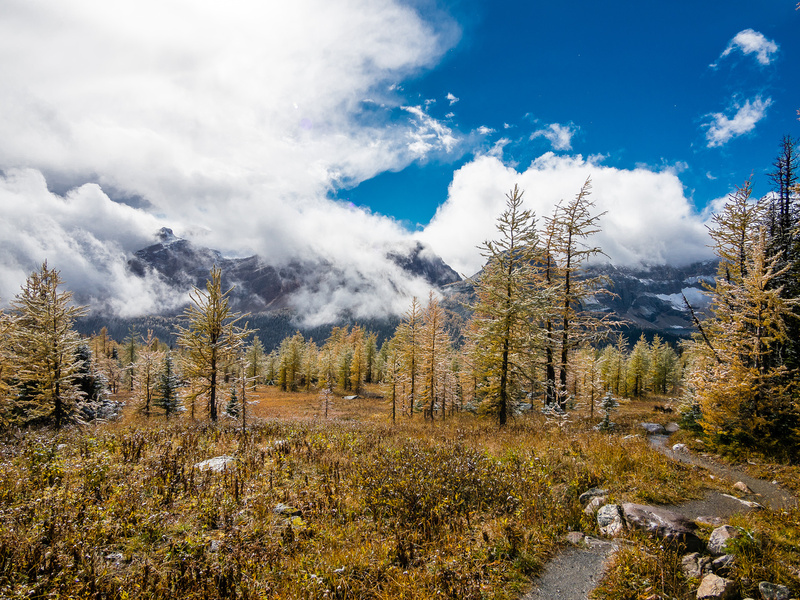 Just as I gain larch forests again, the weather starts to clear! Looking back over the Egypt Lakes area. Nearing Healy Pass with Pharaoh at left and Healy Pass Peak at upper right. I had the whole area of Healy Pass all to myself! One last shot - I can't help myself. One more last shot - I can't help myself. Lovely hiking in Healy Meadows. 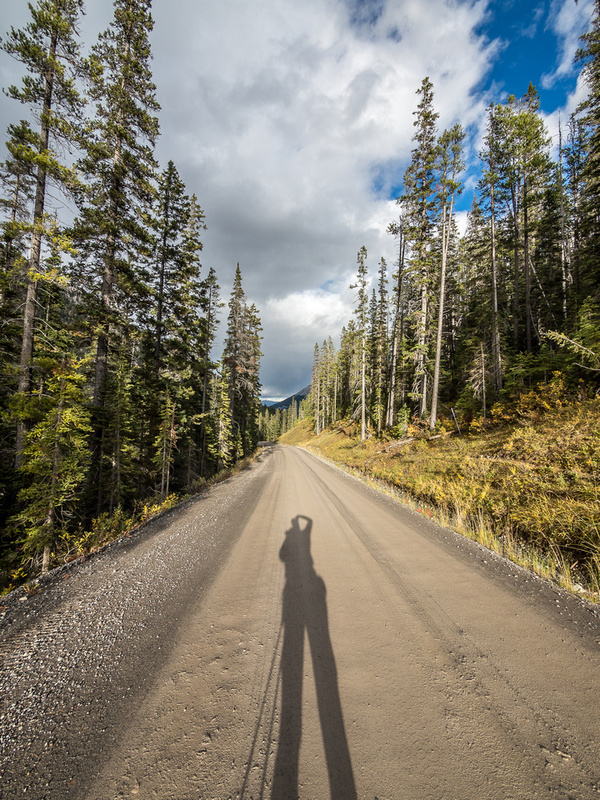 The shadows grow long as I trudge down the final stretch of road to the Sunshine Ski Resort parking lot.